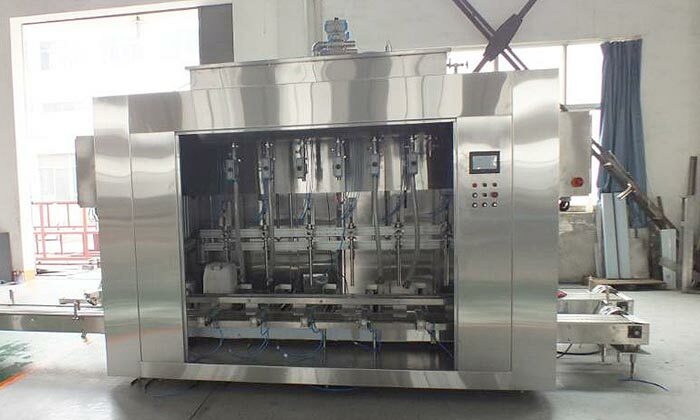 This lube oil bottling machine is for filling 1L to 5L liquid. It automatically achieves counting inlet bottle, gravity filling, and bottle outlet. It is especially good for filling lube oil. It is a nice choice for foodstuff pharmacy, cosmetic and chemical industries. King Machine is manufacturer and suppliers in China,and specialized in providing you with lube oil bottling machine,lube oil filling machine and so on. Lube oil bottling machine with stable performance, convenient operation, high cost performance. 1. This lube oil bottling machine adopts PLC and touch screen control panel, so it is convenient to set. 2. Each filling head has the weigh and feedback system, each filling head can be regulated. 3. Photoelectric sensor, approximate switch and other electric elements are of the international famous brands. It ensures no container miss filling. The host machine will alarm if there is any container blocked. 4. It applies dive method to fill and it reduces foam; it is suitable for various kinds of filling products. 5. The whole lube oil filling machine meets GMP standard, it is easy to clean and maintain, and the parts which contact with the filling material are made of high quality stainless steel. The whole lube oil bottling machine is safe, eco-friendly and sanitary. It adapts to various kinds of working places.